No one can deny the fact that Harry Styles haircut is super charming and flirty. It adds so much style to the whole appearance of the superstar that he cannot be left unnoticed. Styled in layers with a medium length of hair, such a haircut is for brave men who are ready to stand out. It will look best on wavy hair with medium texture creating so much volume. Messy and super cure it will change your whole look drastically. However, be prepared to always be clean with facial hair. Such a hairstyle takes so much attention already that additional one is not necessary at all. If you are ready to look after your hair and cut it more often than you are used to, then just try it on yourself! 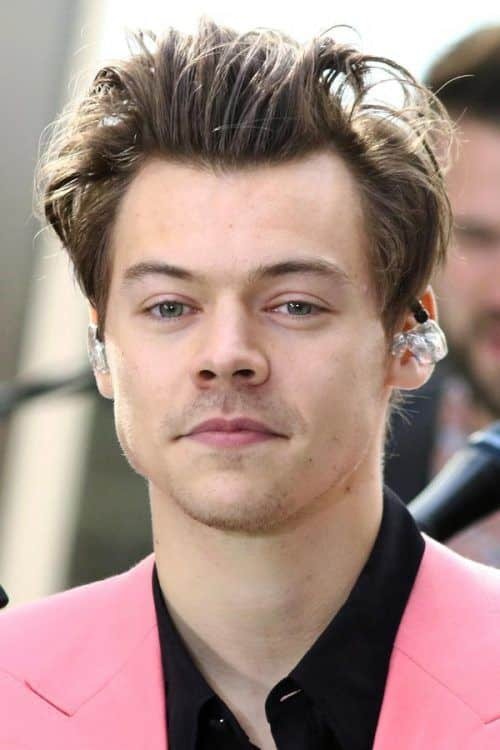 Harry Styles hair is the part of his whole look that makes him look so special among other artists in the industry. However, we know that such a medium haircuts for men are not so easy to maintain on a daily basis. Here are some tips on how to style long hair men. We recommend cutting the length equally all over the head. Make sure your hair is falling from all of the sides. Blow-drying is your key to success with such a hairstyle. Blows dry your hair and create a side parting, then cut the hair that goes along the parting shorter. Use some hair products like a hair pomade to make your hair more texturized. 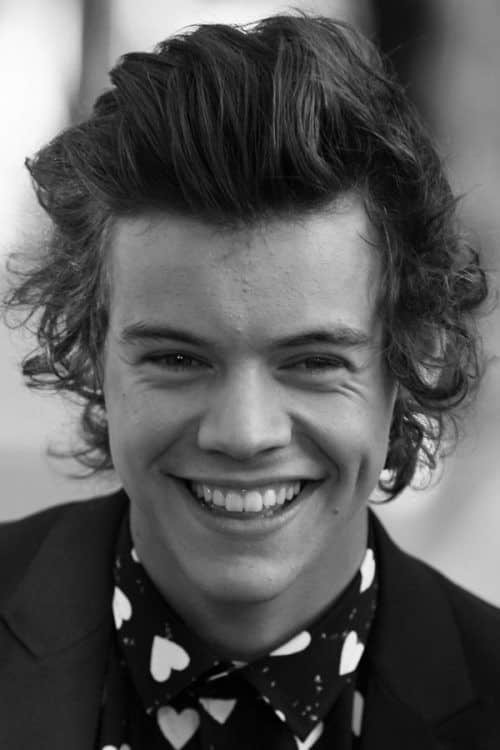 Would you like to know how Harry gets his signature Harry Styles hair? Remember the instructions we are about to tell you. Firstly, add some salt spray to your hair for more volume. Secondly, rub the hair pomade into the ends of hair to get some shine. Then, the most important step is to shake your hair. A naturally styled hairstyle that is so popular. We love it! To get the same effortless but really impressive hair look, you should have a specific hair type. Wavy hair of medium texture will support the weight of the medium length. Men with straighter hair can think of having the same haircut too. We love the results! Among all of the face shapes, we think that the oval one looks best with such a haircut. However, if you have a square face, it is a good option too. It will soften the angles of your face at the top but be careful because the length may make your jawline appear more massive. 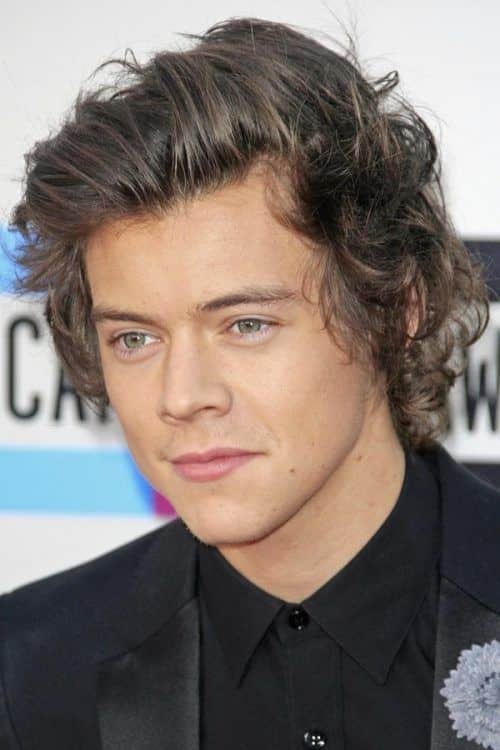 Harry Styles is rocking his cute hairstyle in different ways playing with length and volume. Would you like to see and choose the one that will suit you? 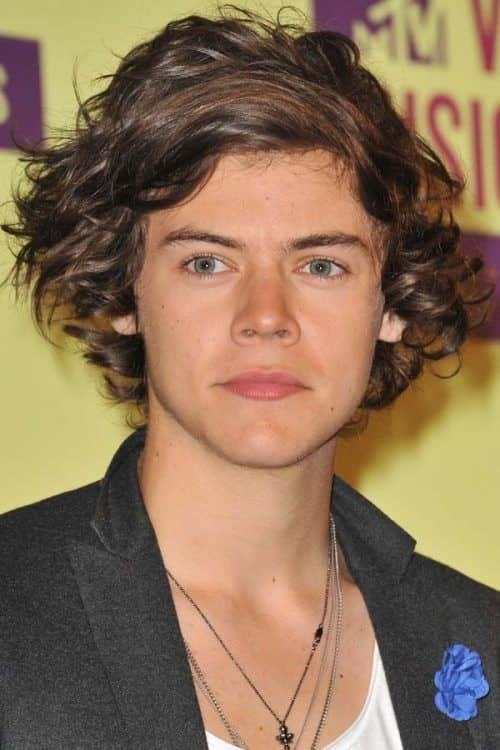 Harry Styles rocks short hair from time to time too! Long on top short on sides is one of his best looks we have seen in years. Such a hairstyle looks good on men with any face shape as it sharpens the features of the face. 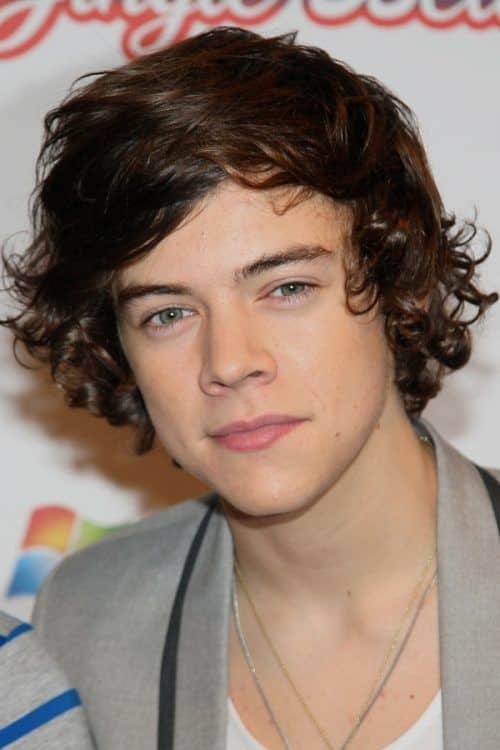 It is a Harry Styles short hair perfection. A mullet haircut is something we all associate with retro. However, Styles make it look so stylish that we can`t deny how good it looks. Shorter at the top layered hair and longer at the back it gives us some vibes we all secretly miss. 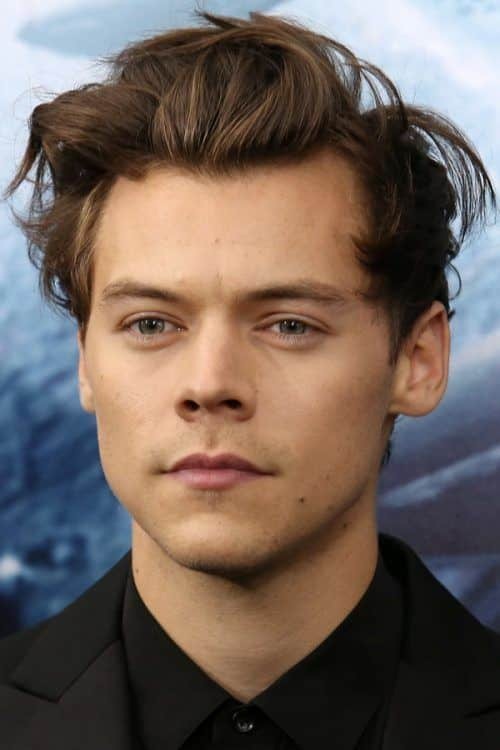 Slicked back hair is the key to the classy hairstyle Harry loves to wear all the time. We love how messy but neat at the same time it is, do you? Curly hair men should read attentively as this is their piece of cake. With a rocky but really charming vibe, the front curls haircut is what we truly adore. Short curly hair men will look absolutely stunning with it! Do have thick hair? Is it curly or straight? Actually, in both cases, you will look bomb with a shoulder-length hair that Harry was rocking while growing out his hair for charity. So many ideas for styling will be available. If your hair is not long enough to be taken into men buns, you can take it up into a half up style. Easy and super comfortable, especially for those people who are outgrowing their hair. We love the textured hair idea! All you need is to put some salt spray to give your curls some definition. Comb through it with your fingers, and you will love how defined your hair strands are. 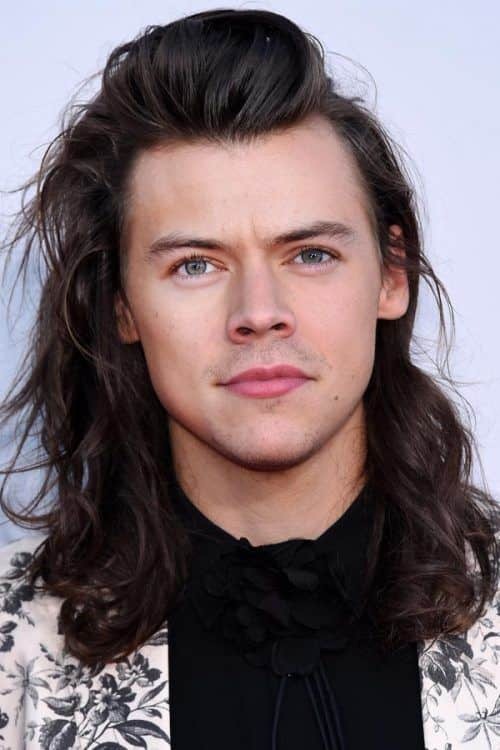 Harry Styles long hair got super popular, and there`s nothing strange about it. Look how gorgeous it is! In combination with slick back hair at the top, it definitely has something unique. Layers look so good on nearly every type of hair. 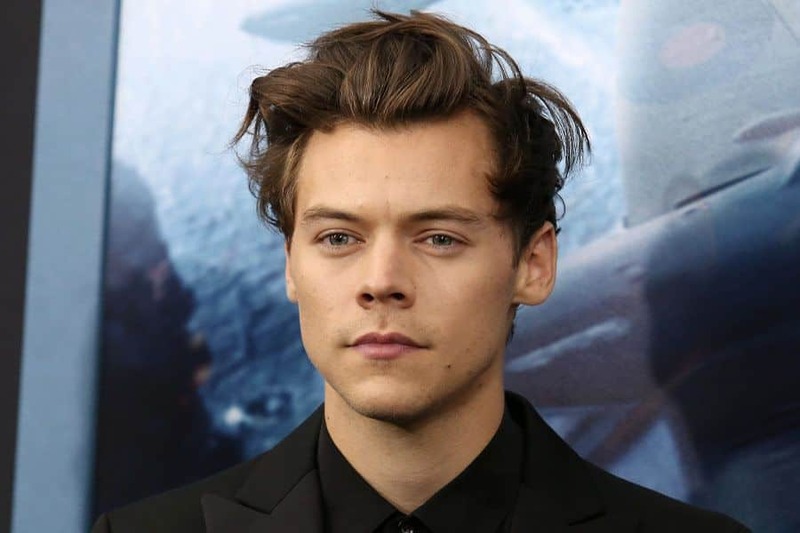 If you have outgrown your hair like Harry did and would like to experiment with it, then this is the idea you should definitely try. Gorgeous, it makes the hair look more voluminous. 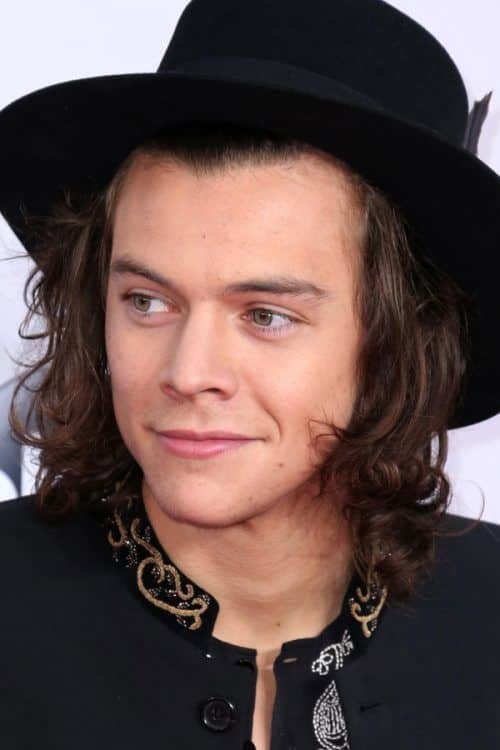 Do you adore Harry Styles hair as much as we do and would like to try it on yourself? We have prepared so many looks for you that will make your new haircut look even more bomb on every stage of outgrowing. Are you ready to experiment?